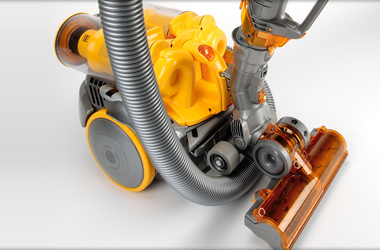 Our expert engineers repair all Dyson vacuum cleaner models. Did you know that the main problem with vacuum cleaners occurs when parts clog up with dust and other particles causing loss of suction & overheating or burnt out motors. It's always best to empty and clean the inside of your vacuum before calling us to make sure that trapped dust and debris is not causing the problem. If the problem persists we will be happy to send out one of our fully accredited engineers to repair your unit quickly and efficiently, and at a flat rate fee, so there's no hidden costs. We will be happy to discuss any question over the phone prior to setting an appointment.